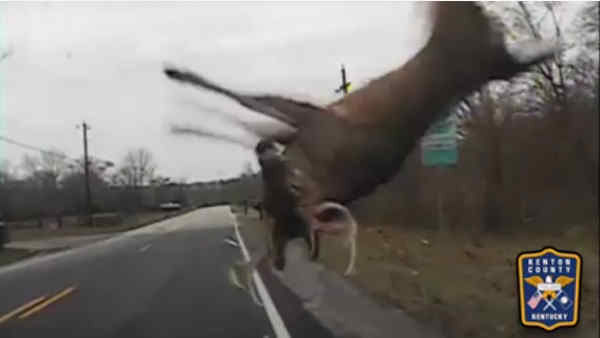 KENTUCKY -- A police department in Kentucky is using an officer's caught-on-camera encounter with a deer to teach motorists how to handle such a situation. The Kenton County Police Department posted the video on Facebook showing the DashCam of an Officer Pittaluga over the weekend. It shows the officer driving down on Decoursey Pike through Visalia and striking the deer, sending it flipping through the air and on to the shoulder. Amazingly, the deer and the officer both escaped serious injury. "Officer Pittaluga applied his brakes and steered away from the deer in a controlled manner," the post read. "Although he didn't manage to avoid the collision, he did maintain control of his vehicle throughout the entire incident, even when the large...deer was performing a triple axel over the hood of his cruiser." The cruiser did sustain some damage.